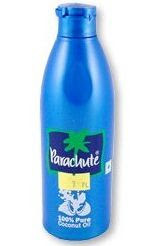 Parachute Coconut Oil 200 ml oil. I simply adore pure, virgin coconut oil and pamper my skin with those luxurious oil-baths every winter. I also put a few drops in my bath everyday and find it extremely moisturizing on my skin. I’ve tried a number of homemade herbal hair-oils and loved them but by far coconut oil remains my favourite. Usually, I massage it on my scalp twice a week, by slightly warming it. Amongst the branded, store-bought coconut oils, I’ve tried Parachute coconut oil, and I’ve found it to be of a superior quality. Manufactured by Marico Industries, it is made of pure dried coconut (“copra”) and is packed in attractive blue plastic bottles with a tamper-proof seal to prevent duplication. It’s also available at Amazon ($4.95 for a 200 ml bottle). You may also purchase an extra large 1 liter bottle for $14.99. It smells nice and the plastic bottle can be slightly warmed by placing it in a container of lukewarm water to liquefy it after overnight freezing in the winter months and also as a hot oil nourishment for the hair. Another variant of Parachute oil comes with an hair oil warmer for a complete and most effective champi (Indian Head Massage). Parachute Advanced website says " A champi with Parachute Advansed coconut hair oil not only nourishes your scalp and hair but also relaxes your mind and nervous system. It helps enhance blood circulation in the head and neck area. The oil lubricates and conditions the scalp, helping to prevent flakes and dry scalp without the use of harsh chemical shampoos.” Recently they have also launched a new product 'Parachute Advansed Revitalising Hot Oil'. It’s a hot oil specially formulated with coconut oil and enriched with warming oils, Rosemary, Thyme and Patchouli to ensure special hair care during winters. Coconut oil -- Moisturizes the scalp, hair and gives healthy, nourished and beautiful hair. Warming oils/ Rosemary/ Thyme/ Patchouli -- Makes the oil hot from within and gives hair extra care. Step 2 : Apply it on your scalp let it soak and then massage it with hands to feel the experience of warmth. Parachute Advansed Revitalising Hot oil is available all over India in an attractive 170 ml pack, priced at Rs. 65/-(approximately $1.3) (Inclusive of all taxes). If you have used this hot oil, please do share your views about it in the comments below. There is sufficient evidence to believe the beneficial effects of hot oil treatments for the prevention and cure of falling hairs. Traditionally one, two or more hair oils are used twice a weak to get good results. Commonly used oils include sesame, olive, soybean or coconut oils. In Asian countries coconut and mustard oils are most popular. A few drops of essential oils like lavender, thyme, bay and so forth are added to base hair oils to enhance their effects. I bought some Parachute oil the other week from my local Indian mart and found, when I opened it, that it smelled "smokey". Is that normal? I have used parachute revitalising hot oil 1 bottle. it is so good. It has nourished my hair and my hair looks healthy now. I want to continue it but is is not available.The first one i got it from Nilgiris super market chennai. Now it is not available there. Where shall I get it? @Ram, I have no idea where it's available in Chennai. Run your fingers through your hair. Concentrate on coating your hair with the oil. Your hair will look slick and shiny from the oil. Using too much oil will take longer to rinse out. A hot oil hair treatment results – conditioned hair.Hot oil treatments can help with dry scalp conditions including dandruff. Since oil and moisturizers are the key ingredient, they can condition the scalp and skin in addition to the hair.